Nottinghamshire took less than an hour on day three to get their County Championship Division Two campaign off to a winning start against Leicestershire at Grace Road. After resuming on 51-6, the hosts at least avoided the indignity of an innings defeat, bowled out for 81. 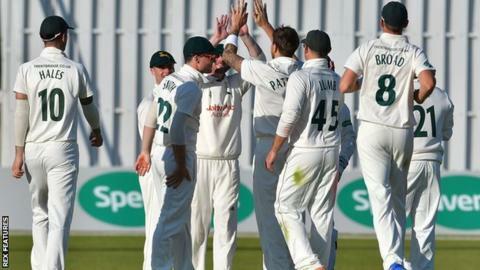 Australia international James Pattinson (5-29) took three of the Leicestershire wickets to fall in 40 minutes. Set four to win, Notts' openers took 10 balls to complete the job on 9-0. Greg Smith rounded it off with a six off Paul Horton to seal his side's 22-point victory in their first game back in Division Two after relegation last season. Luke Fletcher took the other wicket to finish with 4-35, while 26-year-old Pattinson finished with match figures of 8-84, on top of his 89 not out with the bat. Leicestershire pick up just five points, to put them on minus 11, following their eve-of-season 16-point deduction for repeated disciplinary offences. But they are not bottom, as Durham were made to start the season on minus 48 points. Notts now travel to Chester-le-Street to meet fellow relegated side Durham, in a game starting on Good Friday (14 April), when Leicestershire play Gloucestershire at Bristol. "We know we weren't good enough. Facing the likes of James Pattinson and Stuart Broad, world-class bowlers, sets a benchmark. But it's the first game and I need to back these players. "We prepared accordingly and, on the first day, managed to get ourselves out of trouble, then put them under pressure with the ball on day two. But we are better than this and I'll continue to back these guys to bounce back. "It's been a very tough few days with the 16-point deduction on the eve of the match and then this result. But this dressing room has character. Our noses are out of joint, but we're not going to panic over selection." "It's always a great feeling getting a result in the Championship. The partnership between Stuart Broad and James Pattinson got us ahead of the game, and then to come out and bowl the way we did on Saturday night was brilliant. "Then this morning Jimmy Pattinson came down that hill from the Bennett End and bowled rockets, and I was in quite a good rhythm from the Pavilion End. "The dressing room is a good place to be. A a lot of work goes into these games, and sometimes you can get frustrated. But hopefully we'll take this momentum up to Durham and have a good crack there."